^ Full text of "Cazenove journal, 1794 : a record of the journey of Theophile Cazenove through New Jersey and Pennsylvania". [29 September 2014]. ^ Palmer, Robert Roswell; Joel Colton. A History of the Modern World 8. New York: Knopf Doubleday Publishing. 1995: 419. ISBN 978-0-67943-253-1. ^ Lawday, David. Napoleon's Master: A Life of Prince Talleyrand. New York: St. Martin's Press. 2007. ISBN 0-312-37297-3. ^ Bernard, p. 266, 368 fn. ^ Simone Weil. The Need for Roots. Routledge. 2002: 110. ISBN 0-415-27102-9. ^ Brooks, Xan. Happy birthday Salinger. The Guardian (London). 1 January 2009 [28 April 2010]. Cooper, Duff. Talleyrand. New York: Harper. 1932. ISBN 0802137679. Lawday, David. Napoleon's Master: A Life of Prince Talleyrand. London: Jonathan Cape. 2006. ISBN 978-0-224-07366-0. Godechot, Jacques; Béatrice Fry Hyslop; David Lloyd Dowd; 等. 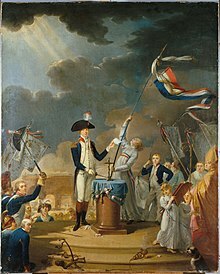 The Napoleonic Era in Europe. Holt, Rinehart and Winston. 1971. Potocka-Wąsowiczowa, Anna z Tyszkiewiczów. Wspomnienia naocznego świadka. Warsaw, PL: PWN. 1965. Waresquiel, Emmanuel de. 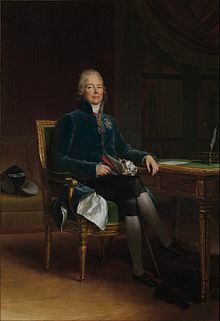 Talleyrand: le prince immobile. Paris: Fayard. 2003. ISBN 2-213-61326-5. Tarle, Yevgeny. Talleyrand. Moskow. 1939. This page is based on the Wikipedia article 夏尔·莫里斯·德塔列朗-佩里戈尔; it is used under the Creative Commons Attribution-ShareAlike 3.0 Unported License (CC-BY-SA). You may redistribute it, verbatim or modified, providing that you comply with the terms of the CC-BY-SA.